Wood Types: Red Oak, Hard Maple, Yellow Birch, Knotty Pine, American Cherry, Jatoba, Walnut & White Oak. False Stair Treads Direct is a tried and tested wholesale & retail supply company we offer many custom stair parts to the consumer ( False Tread Caps is just one of these such items ). With over 350+ shipped full false stair treads orders per year, we can say without a doubt that "we know False Stair Treads!". We are a custom millwork division of Scotia Stairs Ltd. Through False Stair Treads Direct we can now offer a wider range of 100% solid hardwood false stair treads to our ever growing customer base ( for example we can offer all the options listed below for both individual house lot orders or large stock lot orders ). Our product line features the most popular false stair treads hardwood choices in today's market place. 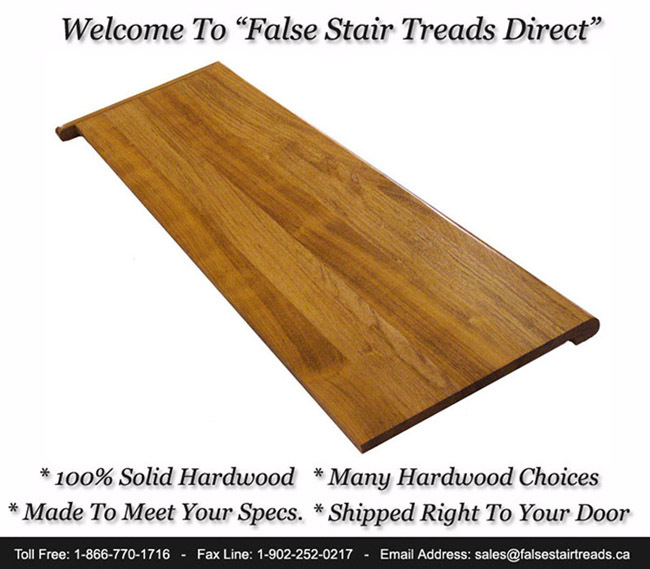 False Stair Treads Direct produces its product line in the following hardwood types: red oak, hard maple, yellow birch, knotty pine, american cherry, jatoba, walnut and white oak. Our false stair treads can be made as square edge, single miter and double miter; all to meet your specific job site needs. Our false tread caps are made with a true body thickness of 3/4". We manufacture our standard false stair treads at a total width a 10-1/4" ( for a bull nose overhang equal to 1-1/4" and a plowed area that is equal to a 9" run ) ( we can make them smaller or and wider if needed ). 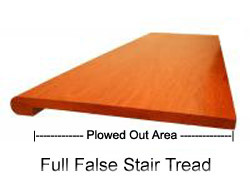 We can manufacture false stair tread lengths of: 36", 42", 48", 54", 60", 72" ( and longer if needed ). We can pre-finish your hardwood false stair treads and risers order in our professional spray booth finish shop, so your treads are ready to install the day you receive them. From a natural clear coat, to a custom stain match to your flooring, or 1 of 25 MinWax colors, when it comes to prefinished stair treads we cover all the bases. Visit our spray booth finish page here to get all the details. 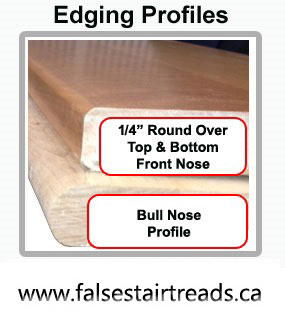 We deliver our high quality false stair treads to all areas of Canada. The typical ship out time ( or turn around time ) for a order is 7-10 days production + shipping time needed to get to your area ( + finishing time if we are do the spray booth finish of your order ). So, from the time you place your order, it can be to your business or home location within 2-3 weeks lead-time for the most part. Note: all false stair treads shown below are custom products and this is why we need the lead-time to make them to your job site needs. The part number(s) of the item(s) you are seeking. The amount(s) that you want. This unique product the full false stair tread allows the DIY'er to accomplish that look he/she longs for without doing a total staircase tear out. This is a great solution for those beat up basement stairs or for any stairs that you wish to re-tread, without doing a full tear out. A full false stair tread is designed to go over an existing tread ( actually it's a 'Solid Cap Tread' ) thus this product is the perfect solution for renovation jobs. With any high volume product in any market place, you must beware of poor quality fakes! Please note: some companies sell flat stock lumber with a bull nose glued on the very front edge, which easy gets torn / ripped off as it is the pressure point of where your foot meets the tread front. Even worse 'Big Box Stores' like: Home Depot, Home Hardware, Lowes, Kent Building Supplies and Rona are selling veneer false stair treads with a press wood or a styrofoam core ( this is not a quality full tread cap and only offers the consumer a cheap, short lasting solution ). Our full false treads are made to meet and exceed stair parts industry standards, made to your fitting size needs, and made to last! Alberta ( ALTA ) - Calgary, Edmonton, Grande Prairie, Lethbridge, Medicine Hat, Red Deer, St. Albert, Strathcona, Wood Buffalo, Etc... British Columbia ( BC ) - Abbotsford, Burnaby, Coquitlam, Delta, Kamloops, Kelowna, Langley, Vancouver, Nanaimo, North Vancouver, Richmond, Saanich, Surrey, Victoria, Etc... Manitoba ( MAN ) - Brandon, Winnipeg, Etc... New Brunswick ( NB ) - Fredericton, Moncton, Saint John, Etc... Newfoundland-Labrador ( NL ) - Conception Bay South, Corner Brook, Mount Pearl, St. John's, Etc... Northwest Territories ( NWT ) - Yellowknife... Nova Scotia ( NS ) - Amherst, Antigonish, Bedford, Bridgewater, Cape Breton ( Sydney ), Dartmouth, Halifax, HRM, Kentville, New Glasgow, Pictou, Sackville, Truro, Valley, Windsor, Wolfville, Yarmouth, Etc... Nunavut ( NUNA ) - Iqaluit... Ontario ( ONT ) - Barrie, Brampton, Brantford,Burlington, Cambridge, Greater Sudbury, Guelph, Kawartha Lakes, Hamilton, Kingston, Kitchener, London, Markham, Niagara Falls, Oshawa, Ottawa, Mississauga, Peterborough, Pickering, Sarnia, Sault Ste. Marie, St. Catharines, Thunder Bay, Toronto ( Greater GTA ), Vaughan, Waterloo, Windsor, Etc... Prince Edward Island ( PEI ) - Charlottetown, Summerside, Etc... Qubec [ Quebec ] ( QUE ) - Gatineau, Laval, Levis, Montreal, Longueuil, Quebec, Repentigny, Saguenay, Saint-Jean-sur-Richelieu, Sherbrooke, Terrebonne, Trois-Rivi res, Etc... Saskatchewan ( SASK ) - Moose Jaw, Prince Albert, Regina, Saskatoon, Etc... Yukon ( YT ) - Whitehorse. Copyright © By FalseStairTreads.Ca - False Stair Treads Direct Is Fully Owned & Operated By Scotia Stairs Ltd.